Every Sunday, my parents and I would go to eat dosa, or crispy South Indian rice crepes at the Super Snack Bar in Alipore, which seemed at the time a long drive from our home in Calcutta’s Ballygunge neighborhood. My dad loved dosa, and since he was frequently away on business trips, I looked forward to these dosa expeditions when he was back. Super Snack Bar was always very busy on Sunday mornings. The air would be heavy with the smell of frying dosas, unfamiliar spices and fermented batter. I remember being placed on the tall black countertop at the restaurant, small legs dangling over the side, where patrons stood and consumed their dosa. I would wait impatiently for the food to arrive, and would immediately attack my dad’s plate, dipping bits of crunchy golden dosa and pieces of steamed rice-and-lentil cakes called idli into the very spicy coconut chutney and fiery red-hot lentil soup called sambar. Busy waiters circulated with the tiny cups of extra sambar and coconut chutney. The spicy sambar was difficult to consume in any meaningful quantity, and I would watch round-eyed as my mother drank hers easily. “That’s what it means to be a grown-up,” I would think. “Someday, I’ll be able to take all that heat and spice too.” Over the years, I encountered many sambars, some tasty and found during South India travels but others mostly bland, lackluster and uninspiring. It took the finding of a South Indian husband, and the arrival of a South Indian mother-in-law to understand how a proper sambar should taste. The secret to my mother-in-law’s recipe lies in the sambar powder or dry masala that she makes from scratch instead of using a packaged mix. Although it may seem tedious to make the masala, it is entirely worth the effort. This dry mixture keeps well in an airtight container for several months. I also enjoy adding vegetables, such as small whole eggplant, tiny whole onions and pieces of lauki or bottle gourd to my sambar when the tamarind-water mixture is being boiled, but this is entirely optional. 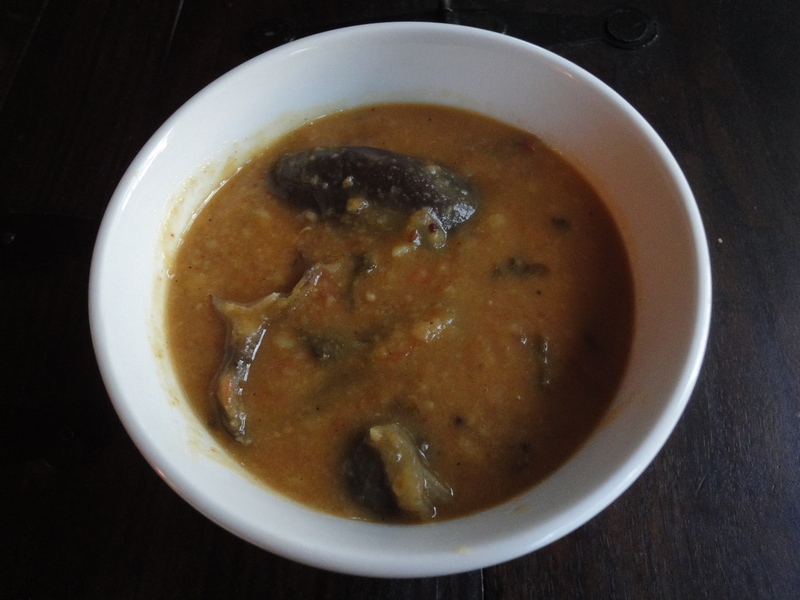 Sambar is usually served with rice, idli, dosa and fried lentil donuts called vada. 1. Heat the first set of spices in a pan with a little ghee, on medium flame for 3-4 minutes until the fragrant smell of spices is released. Follow this order: chana dal, urad dal, cumin seeds, coriander seeds, black peppercorn, and dried red chillies. 2. Separately, fry the pinch of asafoetida and fenugreek seeds with a spot of ghee until the fenugreek seeds become a little dark in color. 3. Coarsely grind all of the spices in a dry spice grinder or coffee bean grinder, including the coconut. 4. Add some water and make a paste. Note: the dry spice mixture, before adding coconut can be stored for later use. 1. Place the toor dal in a pressure cooker with water:dal in the ratio 2:1 and cook on medium heat until the cooker emits 3 whistles. Meanwhile, heat the ghee in a pan and sputter the cumin seeds, asafoetida, dried red chillies and mustard seeds. Next, add the onions and fry till they become brown. 2. Add the tomatoes and cilantro. Cook till tomatoes are tender. 3. Add tamarind and salt to taste. Add about 2-3 cups of water. When the mixture comes to a boil, add the sambar masala paste (about 2-3 tbsp or to taste) and the boiled dal to the mixture. Add water as needed for desired consistency. 4. Bring mixture to boil. Continue to boil for 1 or 2 minutes until the sambar gets its taste. yummy….completely agree about adding veggies to sambar. in addition to the ones you mentioned, i often add 1-inch size okra pieces or green peppers and it really rounds out the dish. try adding fenugreek seeds to the mustard seeds at the start, that also gives a unique flavor.